One of the things I needed to do recently was add some extended properties to objects. I got the idea of using them from John McClusky at SQL Bits. He had a great presentation on tSQLt that’s worth watching. In any case, I wanted to add, and update, extended properties. I had used SSMS to do this, but it’s cumbersome. I decided to experiment and see how the T-SQL code works. My browsing of Books Online showed me there are a few procedures used, one each for adding, updating, and deleting properties. I decided to start with sp_addextendedproperty. This procedure takes some interesting, rather unintuitive arguments. Name and value are easy to understand. These are the name of the property and it’s assigned value. One thing to note is that value is a sql_variant, which should work fine for most situations, but CASTing may be required. However the next arguments are level 0, 1, and 2, with a type and name for each. Those didn’t make much sense at first. In fact, as I wrote a few scripts, I had to keep looking up the meanings. Essentially we have three classifications of objects. The outer containers, the objects, and the dependent objects. I’ll explain them below. The level0 type is essentially the class of object. Is this an Assembly, a Contract, a Schema, etc. For my purposes, this has always been a schema, but certainly you could add properties to the other classes if you needed them. The level1 is the object type that we usually work with: table, view, function, procedure. For me this is pretty much been table, view or procedure, but certainly function is something I’d use as well. The level2 is the dependent object: the trigger, the column, the parameter, the constraint. These I haven’t really used, but I certainly think that adding in properties for indexes, triggers, etc are valuable. Adding a property is easy. For example, one of the items I add is a PK exception for heap tables. To do that (for the SalesHeader_Staging table), I’d run this. I can see this easily in SSMS. 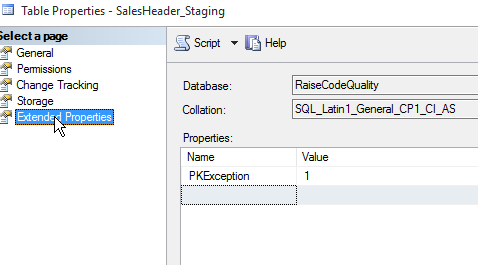 Properties are great ways to add additional information to an object in SQL Server, though I certainly wish they were more visible in objects. I knew there was a procedure to do this, and a quick search on extended properties got me to the BOL reference. I was experimenting with adding the properties while working on this, and I had to research the meanings of the parameters a bit, so this took about 20 minutes to get ready for publication. I have to use that for defining columns/tables that our development team forgets to define things during their process. I have the snippet SQL Prompt. Works great! I’ve put a snippet in SQL Prompt as well, with schema and table as defaults since those are what I used most often.